A beleaguered Chelsea travel to Malmo in the Europa League last 32 first leg, looking to respond from Sunday's 6-0 thrashing at Manchester City. That humiliating defeat was the Blues' third consecutive loss away from home, conceding 12 goals in the process without reply. However, Maurizio Sarri's side are unbeaten on their travels in Europe this season and comfortably topped Group L to progress to this stage. Swedish outfit Malmo finished second in Group I behind Genk, as they look to triumph in this competition for the first time in their history. With the pressure building on Sarri and his team, they know only a win will avenge their recent woeful away form. Here's 90min's breakdown of Thursday's clash. Malmo manager Uwe Rosler has a near fully fit squad to choose ahead of this tie, with their domestic season not due to start until April. Meanwhile, having found himself at the centre of transfer speculation throughout January, Chelsea's Callum Hudson-Odoi could be in line for a ​start over Pedro, who featured last weekend. Likewise, Gary Cahill could make a rare appearance after featuring just seven times in all competitions this term, whilst ​Gonzalo Higuain is eligible to feature after the rule that previously prevented players from representing two clubs in Europe in a single season was abolished. Malmo​ Dahlin; Vindheim, Nielsen, ​Bengtsson, Safari; Rieks, Christiansen, Bachirou, Lewicki; Rosenberg, Antonsson. ​Chelsea ​Kepa; Azpilicueta, Cahill, Christensen, Emerson; Loftus-Cheek, Jorginho, Kante; Hudson-Odoi, Higuain, Willian. Thursday's meeting will be the first ever competitive fixture between these two sides, with Malmo winning just once on five occasions against English teams in Europe. Their only success came against Nottingham Forest in a 2-1 victory in 1995. Once managed by current Crystal Palace boss Roy Hodgson, the Swedish giants are looking to upset the odds under new man Rosler. Their only European Cup final appearance came in 1979 in the European Cup, eventually losing out to Forest. Marcus Antonsson is the club's top scorer in the competition with five from eight outings. Despite their recent blip in the Premier League, ​Chelsea have found life in Europe easy going after winning five of their six group games against the likes of PAOK, BATE and Vidi. 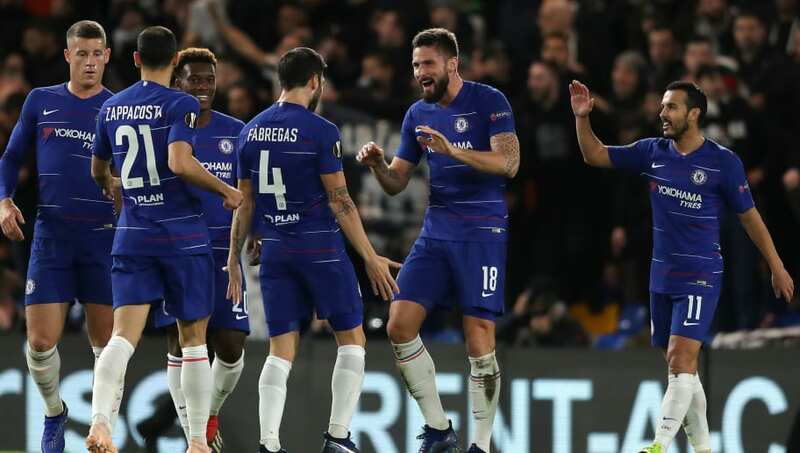 Netting four goals in five appearance, ​Olivier Giroud has been a key part of their success, as has Ruben Loftus-Cheek who is Chelsea's second top scorer with three goals. Sarri's outfit will be looking to lift the trophy six years after their last success under Rafael Benitez. Here's how each side has faired in the last five fixtures. With unprecedented scrutiny on Sarri ahead of a critical period, he may be forced to play his big guns in order to progress to the last 16, including ​Eden Hazard and Higuain. On the other hand, Malmo qualified for the Champions League group stages in their last two seasons prior to this and will be no pushovers. A shock could be on the cards if the decorated Blues underestimate their minnows, but they should have enough to take a lead back to Stamford Bridge for the second leg.